The Smithsonian National Zoological Park, commonly known as the National Zoo, is a wonderful attraction for families on holiday in Washington DC. As part of the Smithsonian Institution, the zoo has no entry fee and offers visitors the chance to explore 163 acres of habitats containing more than 1,800 animals, a fifth of which are endangered. 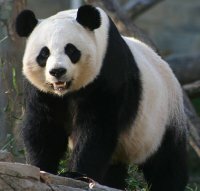 The star attractions of the zoo are definitely the giant pandas. Other popular exhibits include the Great Ape House, Elephant Trails, Lion/Tiger Hill, Cheetah Conservation Station, and Seals and Sea Lions Exhibit. The National Zoo was the home of the original Smokey Bear, who was a symbol of forest fire prevention and lived at the zoo from 1950 to 1976. Transport: Metrorail Red line to Cleveland Park station. Metrobus lines L1, L2, and L4 stop at the Zoo's Connecticut Avenue entrance, and H4 stops at the Harvard Street entrance. Opening times: 8am to 7pm, last admittance at 6pm.